Today, the relevance of the textile medium as a technique, material, and metaphor in contemporary art, architecture, and criticism is growing. Nonetheless, the rise of textiles as a prominent medium of art since the 1990s has not been subjected to comprehensive historical and theoretical reflection thus far. The present volume attempts to map out some of the many meanings and functions of textiles in contemporary art so as to articulate a “metatextile” theory or a “textile discourse”. 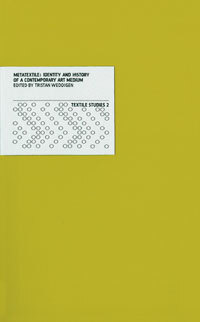 The authors discuss such central aspects of the contemporary textile medium as narrative, identity, myth, clothing, technology, deviance, faith, gender, architecture, reproduction, ornament, anthropology, postcolonialism, phenomenology, and historiography. The present collection of essays in English, German and French aims to contribute to a new discussion on the textile medium, its identity and history.